SMU’s fifth Celebration of Judeo-Spanish Culture from 1:30 to 4:30 p.m. Sunday, Jan. 20, will feature personal Sephardic stories, an update on Ladino studies and a concert of Ladino music. Ladino is a historic Jewish language with a geographically diverse distribution that developed a rich cultural heritage since its emergence in medieval Spain. • M. E. Rios will recount his experience of gaining Spanish nationality as a descendant of Jews forced to convert in Spain and later persecuted by the Inquisition. • Alejandro Acero Ayuda will present an updated report of the current status of Ladino in the 21st century. • Austin musician Michelle Alany and friends will perform Sephardic music infused with tasty Texas-blues twist. The coffee break will include Sephardic sweets. The free public event will take place at McCord Auditorium on the third floor of Dallas Hall, 3225 University Blvd., at Southern Methodist University. No registration is required. Patrick Michaud, assistant director for robotics education at the University of Texas at Dallas, will be the guest speaker at Congregation Beth Torah Men’s Club’s breakfast at 9:30 a.m. Sunday, Jan. 20. Michaud will discuss the importance of robotics in education and engineering, and his role in robotics competitions. He, his students — and their robots — will present a demonstration of their work. The public is welcome at the lox-and-bagel breakfast, which costs $10, $5 for students. Beth Torah is located at 720 W. Lookout Drive in Richardson. Titled “The Real Mensches of DFW: Great People. Good Deeds,” this year’s gala moves away from the traditional honoree dinner. Instead, seven community leaders — Neil Beckerman, Julie and Jay Liberman, Lillian and Jon Pinkus, and Jackie and Steve Waldman — will partner with students in grades 5-8 to help them perform acts of service for four area nonprofits that are aligned with Levine Academy’s core values. The organizations are The Holocaust and Human Rights Museum, The Legacy Senior Communities, Jewish Family Service of Greater Dallas and The Jewish Federation of Greater Dallas Partnership 2Gether, supporting the Western Galilee in Israel. The evening will begin with cocktails, silent and live auctions, and a multicourse dinner, with entertainment provided by DJ Brooks Butler. The evening will culminate with a video presentation and speeches highlighting the students’ community contributions. For information about sponsorship opportunities, tables and tickets, visit www.bidpal.net/levinegala. 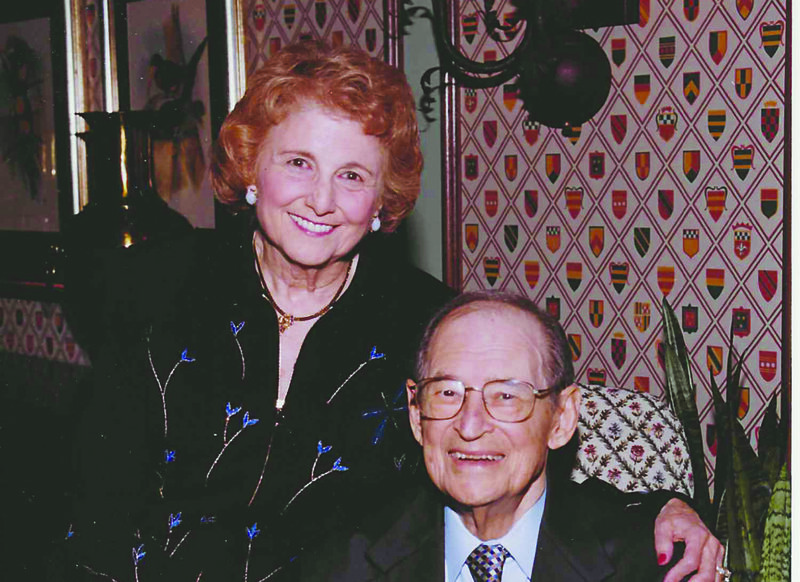 One of the JCC’s signature events, the annual golf tournament, is changing its name to honor a longtime pillar who recently died.. Moving forward, the Aaron Family JCC Golf Tournament will be named the Maxine and Erwin Waldman Memorial Golf Tournament. This year’s tournament will take place on Monday, June 3. Proceeds from the event will continue to support the Joanie I. Weinstein Camp Scholarship Fund and Elaine Quint Schrager Preschool Scholarship Fund at the JCC. Through sponsorships and raffle proceeds, the Aaron Family JCC is able to fund these scholarships for children to attend J Camps and the Goldberg Family Early Childhood Center. Yavneh students who scored in the top 2 percent on the ACT and SAT are, front row, from left, Jenna Sasson and Maayan Abouzaglo; middle row, Ezra Ruderman, Ben Levkovitch, Max Weinstein, Zach Bernstein and Adam Frydman; and back row, Simcha Malina, David Cohen, Jonah Schwarz-Mullins, Leib Malina, Ari Berke and Yosef Weiss. Thirteen Yavneh Academy students have scored in the top 2 percent of national college admissions testing — SAT and ACT — including a perfect score of 36 on the ACT. 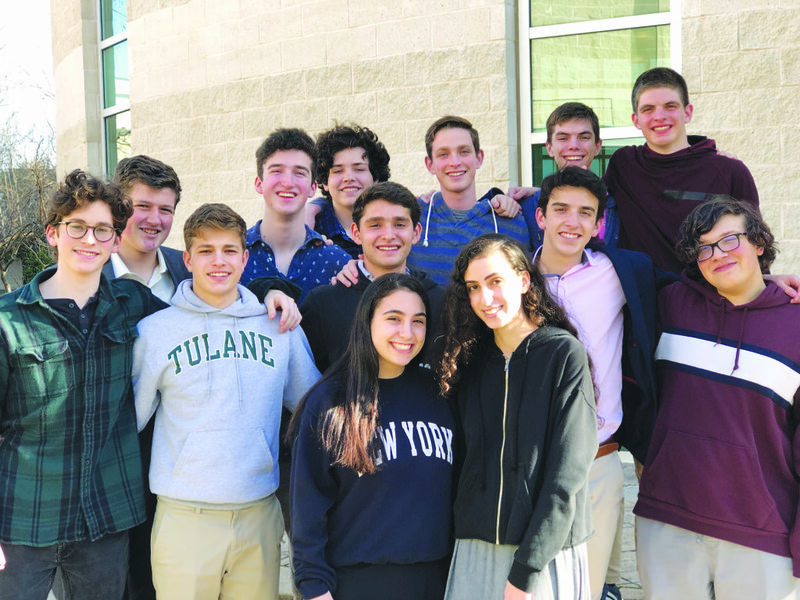 Nine Yavneh seniors and four Yavneh juniors earned SAT scores averaging more than 1,500 (out of a perfect 1,600) and ACT scores averaging more than 34 (out of a perfect 36). The high achievers are Maayan Abouzaglo, Ari Berke, Zach Bernstein, David Cohen, Adam Frydman, Ben Levkovitch, Leib Malina, Simcha Malina, Ezra Ruderman, Jenna Sasson, Jonah Schwarz-Mullins, Max Weinstein and Yosef Weiss.